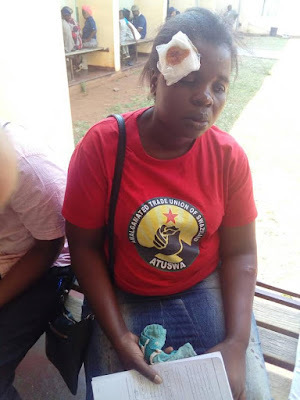 Several workers were badly injured from beatings, rubber bullets and teargas fired by police in riot gear during demonstrations for better wages and working conditions in Swaziland on Tuesday (18 September 2018), writes Kenworthy News Media. – The police fiercely harassed workers who were protesting in Manzini and injured six of them in the process. The workers had to run helter-skelter for safety. These rogue measures by the police are simply desperate means of defending King Mswati’s passionate love for luxury, SUDF Secretary General Brian Sangweni said. – We are humbled by the great numbers. It goes to show that TUCOSWA represents the aspirations of the downtrodden majority, said Mkhonta.